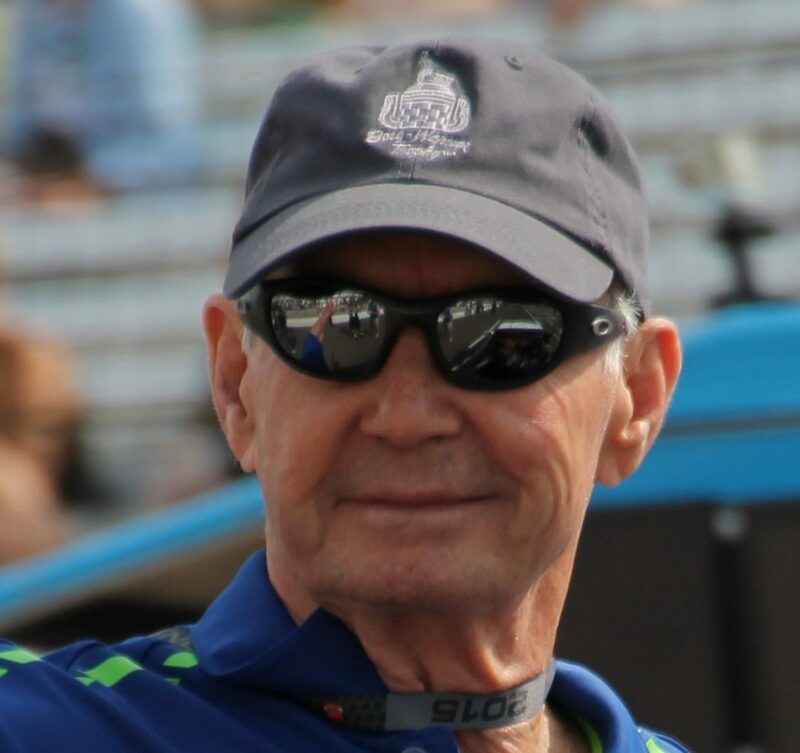 Parnelli Jones at Indy in 2015. Photo by Sarah Stierch. He was successful as a driver, on pavement and off, and later enjoyed wins and championships as a team owner. Mario Andretti called him “the greatest driver of his era,” who “won with everything he put his hands on,” while Dario Franchitti referred to him as “possibly one of the toughest guys ever in racing.” With praise like that and near-lifelong ties to Southern California, it’s fitting that a tribute to Parnelli Jones will kick off the opening of the Petersen Museum’s latest exhibit, Legends of Los Angeles. Born in Texarkana, Arkansas, in 1933, Jones was still a boy when his family relocated to Torrance, California. Racing caught his attention early, and in 1952 he ran his first stock car race at a small California dirt track. By the end of the decade, Jones (who was born Rufus Parnell Jones, but adopted “Parnelli” to hide his early racing exploits from his family) was racing professionally, driving midgets, sprint cars and stock cars at tracks across the country to earn a living. His first foray into Indy Car racing – then the USAC Champ Car series – came in 1960, when Jones ran eight races, delivering a podium finish at Sacramento in his last race of the season. In 1961, he shared Indianapolis 500 Rookie of the Year Honors with Bobby Marshman, and in 1962 became the first driver to qualify at the Brickyard above 150 mph (151.153 mph, to be precise). The following year, 1963, saw Jones take his only Indy 500 win as a driver, but in seven starts he went on to lead 492 laps at the Speedway. By the time he walked away from driving Champ Cars in 1968, Jones had earned six wins in the series. 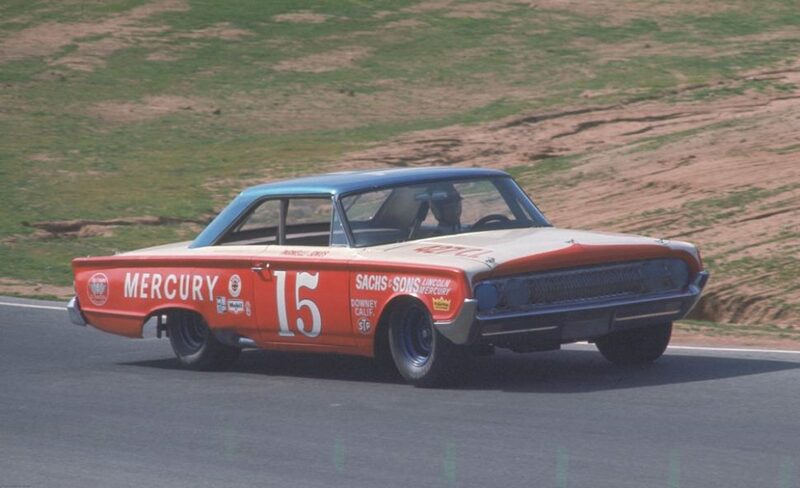 Racing the Mercury Marauder at Riverside in 1965. Image courtesy Ford Motor Company. By then, his resume included two wins with a Bill Stroppe-prepared Mercury Marauder in the stock car class at Pikes Peak (in 1963-64), a USAC stock car championship (in 1964, also with a Mercury Marauder), a USAC Midwest Sprint Car Championship (in 1960) and numerous starts in a Bud Moore-prepared Mercury Cougar in the SCCA Trans-Am series. With partner Vel Miletich, Jones was a team owner, too, founding Vel’s Parnelli Jones Racing in 1967. With star drivers like Al Unser Sr., Mario Andretti and Joe Leonard, the team would earn Indy 500 wins in 1970-’71 (both with Unser) and USAC Champ Car titles in 1970-’72 (one with Unser, two with Leonard). From 1974-’76, the Vel’s Parnelli Jones Racing team even dabbled in Formula 1, making 16 starts and earning six top-10s in three seasons with Andretti behind the wheel. Cost, combined with a lack of sponsorship, ultimately ended the team’s F1 efforts, but not before running a patriotic USA Bicentennial livery at the 1976 South African and Long Beach Grands Prix. 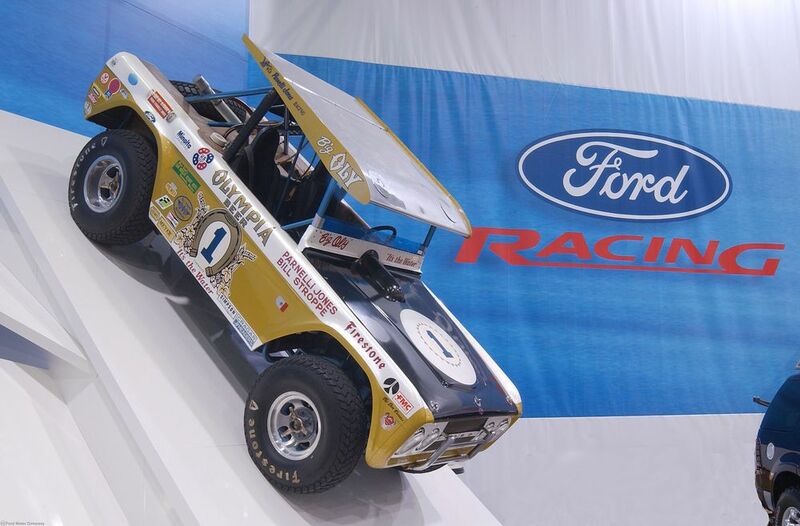 The 1970 Big Oly Ford Bronco driven by Parnelli Jones that won the Baja 1000 race in 1971 and 1972 on display at SEMA 2002. Image courtesy Ford Motor Company. It was Stroppe who gets credit for dragging Parnelli Jones into off-road racing. The story goes that – at a Christmas party in front of a crowd of people – Stroppe challenged Jones to try racing on dirt. Jones, who’d competed on dirt tracks throughout his USAC career, declined. Stroppe pressed his luck, saying perhaps racing off-road was too hard for Jones, and a new partnership was formed. Though Jones was hard on equipment at first, he and Stroppe eventually settled into a rhythm that saw the duo win two Baja 1000s (1971-’72), while Jones earned two Baja 500 wins of his own (1970 and ’73). An accident in the 1974 Baja 500 ultimately prompted Jones’ retirement as a full-time off-road racer. Parnelli Jones signed memorabilia, such as the helmets pictured above, will be auctioned during the VIP opening night reception on November 8. Remaining images courtesy Petersen Museum. Jones, now 85, still lives in the Torrance, California area, and while it isn’t clear if he’ll attend the opening night VIP reception for the Legends of Los Angeles exhibit, taking place on Thursday, November 8, plans include a video presentation of his life and achievements, a guided tour of the vehicles displayed and an auction with memorabilia signed by the motorsport legend. 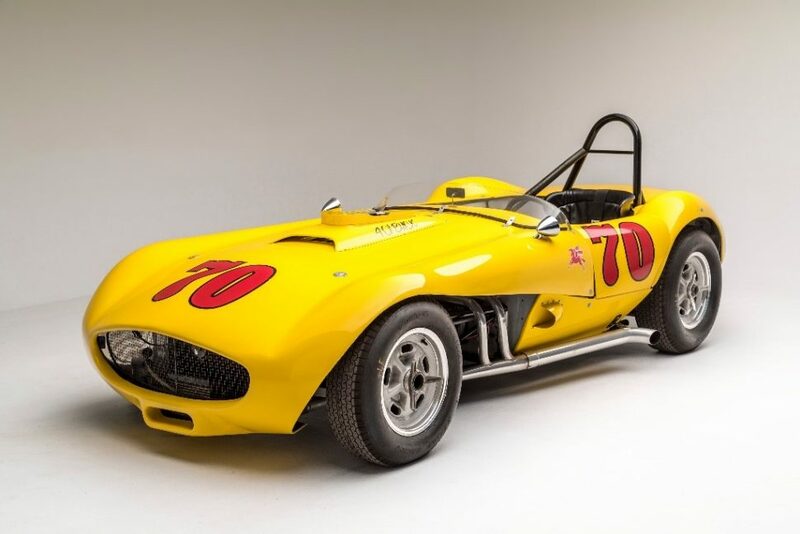 Southern California builders represented in the exhibit will include Max Balchowsky, whose Hollywood Motors shop produced the “Ol’ Yaller” series of sports racers. Seen here is Ol’ Yaller IX, built in 1963. Complete details on the exhibit – which will be staged in the museum’s Charles Nearburg Family Gallery – are still pending, but plans call for 11 race cars with ties to builders like Harry Miller, Fred Offenhauser, Frank Kurtis and Max Balchowsky to be displayed with artifacts and a 180-degree panoramic video. Legends of Los Angeles will examine the area’s cars and venues, too, illustrating Southern California’s starring role in the history of motorsports. The exhibit opens to the public on Saturday, November 10; for additional details, or to purchase tickets to the opening night reception, visit Petersen.org/Legends.